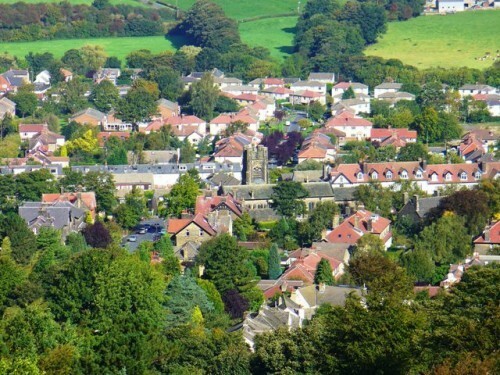 Ben Rhydding is a very pleasant residential community situated at the eastern fringe of the town of Ilkley, between the moors and the A65. Ilkley itself is a small resort town on the edge of the Yorkshire Dales with a good range of local amenities. At the 2011 census, the parish population was 3,900. It is a settled community with a large proportion of professional people. Ben Rhydding has a number of shops including a butcher, hairdresssers,tailors, cafe, florist and various other trade premises. Ben Rhydding now has a public house/hotel which was lost a few years ago but after much community spirit was shown in trying to reinstate it, with many church members involved in the campaign this came to fruition with its opening as the Wheatley in May/June 2009. Ben Rhydding is popular with young families as well as being within easy commuting distance of the cities of Leeds and Bradford. 80% of homes in Ben Rhydding are owner occupied. Ben Rhydding does not share the ethnic diversity of local towns such as Bradford and Leeds. In June 2006, Ben Rhydding held its first ever Community Fete, which was masterminded by a member of St Johns, with significant contributions to the day being made by many other members of the church. This has now become an annual event and the 14th Community Fete will be held on 20th June 2020 from 2pm to 4pm on Wheatley Fields Recreation Ground. Entrance is free. If you would like to become involved in the organisation of a future event more details can be found on www.benrhyddingfete.co.uk. Note no fete in 2019. Ilkley itself is a thriving spa town, set in the Wharfe valley and with the stunning backdrop of Ilkley Moor and the famous Cow and Calf rocks. There are a number of excellent primary schools in Ilkley and Ben Rhydding and the older children have the benefit of Ilkley Grammar School which continues to achieve excellent exam results. Ilkley is culturally rich, hosting the Ilkley Literature Festival once a year, which draws in many famous speakers. The 2019 Festival runs from late September to mid October. Visit www.ilkleyliteraturefestival.org.uk for more details. There is also the Moor Music festival, Ilkley Summer Festival, May Day Carnival and many other special events. Ilkley boasts a thriving theatre, live concert venue, cinema, a number of choirs and many other performing arts related activities. There are a wide range of restaurants, cafes and places to drink too. For more details on the Ilkley area see the local website at www.ilkley.org. Do visit our photo gallery to see some views of the wonderful countryside in this area of Yorkshire.